Has someone done a successful marriage extension using the income method without an embassy affidavit or a job? I am sure there have been people that have done it but I don't recall any reports of it being done for an extension based upon marriage. There have been a few based upon retirement. I cannot see a problem doing it since it is certainly allowed according to the rules that went into effect in December. The problem is that many of us don't have 12 months of international transfers and need to find out if any IO are giving leniency or been flexible for only having a few months of international transfers. This is the most important issue for many of us! The have been directed to be flexible in a memo from the head of the Immigration Bureau. I have posted the original memo and a translation as downloads at number 16 on the pinned topic for laws and regulations. I have been suggesting that people start transferring the funds as soon as possible since it was first announced. The more transfers you have the better. I tried doing it with 12 months of transfers and was denied. IO said I needed 400k inside my account which I didn't have. Next day I went back with embassy letter. IO processed my paperwork without even looking at my bank documents. I'm very keen to see what happens to the married folks without the income letter or a job. Are you from one of the countries which still issues income letters? I went there without the letter because I was trying to avoid paying the embassy fee. It says either one (by a or statement) is acceptable in the amendment to the police order. But it seems some office have decided otherwise. It's harder for them to challenge a letter from the embassy. Without the letter I'm assuming people are going to have to prove 'how' their money is being made. Why do I think this? For the folks that don't have sufficient funds to meet the monthly minimum, as Pib mentioned on a previous thread, they could always be recycling their money back and forth from their home country. Also if a bank confirmation letter, bank statement, passbook, and credit advices is all that's needed when applying for an extension, then those people without the embassy letter shouldn't have any issues when applying for the extension right? Just curious, for you guys doing monthly income retirement extensions, do they not ask you where your funds come from? for extension based on marriage : would it be a problem to do in stead of 12 x 40.000+ Baht ....4 x 120.000+ Baht to reduce bank transfer fees? You have to show monthly transfers into the country. From the amendment to the police order. Thanks Ubonjoe, but do you have a better copy of the Thai download as it is very blurry and in blue copy. A little hard to read. Thanks!! I do marriage extensions, got last one with embassy letter picked up in February. Asked my IO about future options - 400,000 baht in the bank for 2 months, OR 40,000 baht a month for 12 months into a Thai bank as a foreign transfer. AND it has to be every month a minimum of 40,000 baht. As i spend a couple of months in the UK each year, paying in money when i am not here is not really what i want to do. Also those 12 transfer fees do add up. With Transferwise always a slight risk that it might not go in as a foreign transfer (when i did this as a test it wasn't) . I have decided to go the 400,000 baht route as no monthly stress! I was able to borrow money in the UK at a very low rate and will transfer here when the exchange rate improves (I hope it does). My personal cheapest way of getting money here is via a credit card (i have done all the calculations). I went with a friend to Khon Kaen IO on Tuesday last week. We had to do our 90 day report. I am from the UK and my friend from Norway. My extension is due in May so I enquired about using the Income method, because I get two pensions. One is paid monthly and the other Quarterly. Both the IO that I dealt with AND the Supervisor agreed that they will accept the total of both pensions over a 12 month period, divided by 12 as that will show a monthly average of around 60,000 TB. 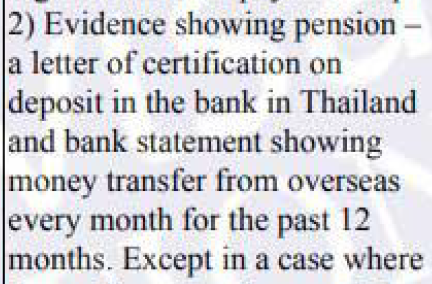 They confirmed that I must show a statement for the last 12 months showing the deposits into my Thai Bank - not a problem as this has been happening for several years. My friend was told that he MUST continue to get a letter from his Embassy. I will report again if/when I successfully complete the exercise. I am retired and never had an overnight stay in hospital – any one else here the same . Is there a market to rent out unfurnished condos?